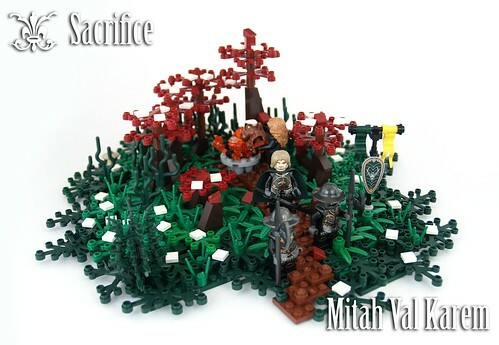 Create a MOC of your character celebrating the winter holidays, whether they are a Garhim villagers ice skating on a frozen lake, or a Loresi Lord preparing a grand feast, get ready to show off your LCC holiday spirit. 2. Your MOC must be built of Lego. Custom string, cloth, weapons and armor are allowed. 3. Your MOC must show your LCC character, along with your faction's sigil and your faction colors. 4. Why not write a story to go along with your MOC? 5. There is no requirements or restrictions on your MOC size. > The entry with the highest score will be the Master Builder winner. > The winner of the LCC Faction-based Holiday MOCS Category will receive 7 points and a custom LCC Holiday signature banner. > The Master Builder winner will receive 10 points, a special custom LCC Master Builder signature banner and three (3) custom resin casted castle minifig accessories from my new "Royal Brick Customs" Store opening in January. So what are you waiting for, grab some hot cocoa, get out those bricks and start building. Please post all contest entries here! Last edited by royalbrickcustoms on Sat Jan 19, 2013 12:55 am, edited 12 times in total. Sounds pretty cool! Just to clarify this is open to all factions but is not a global challenge right? It is just something you came u with and got permission for? it seems that it is open to all lcc members and it sounds like a fun competition. Have to think of something. This contest is indeed open to all members of the LCC. You can see it as a member-initiative GC. Have fun! Teherean wrote: This contest is indeed open to all members of the LCC. You can see it as a member-initiative GC. Have fun! It is exactly what Teherean stated. Hope y'all enter and good luck. You may also use the entry as an entry for CCCX's "Winter Scene" category, but your entry can not have been posted on Flickr, MocPages, Brickshelf ect. before today. Only 5 days left and no entries yet. Have no fear! An entry is Here! Hopefully I can get some competition! Is this ending tonight, or am I too late? friskywhiskers wrote: Is this ending tonight, or am I too late? Tonight at Midnight New York Time U.S.A.
Last edited by mencot on Mon Jan 07, 2013 12:34 am, edited 1 time in total. Phew, that is a relief: I have something small ready but haven't had the time to photograph it... I guess I will be posting it Tuesday or Wednesday. I really hope there will be more entries - I fear LCC has lost it's initial momentum - just as GoH gains traction with the latest story developments. mitah wrote: Phew, that is a relief: I have something small ready but haven't had the time to photograph it... I guess I will be posting it Tuesday or Wednesday. I really hope there will be more entries - I fear LCC has lost it's initial momentum - just as GoH gains traction with the latest story developments. No, I think people are just recovering from the wild building that was the CCCX. Ever since the founding of the City of Karemdhâron in one of the coldest winters in the history of Lenfald (there's some backstory somewhere, either in my CIC or on the Wiki), on the day of the first snow the reigning Lord and a priest(ess) would go into the Wandering Woods and sacrifice livestock to appease the Old Gods and pray for a quick change of seasons. It is said that during the long winters - when there was no livestock left - they sacrificed other things'.